Let us now start implementing Service Broker for two tables in one database. Let me explain the business logic which will be used in this article. Sales people in Company “Extreme Trading” (ET) goes to client site and accept the order from client. Sales people may use iPad, iPhone or any other smart phone, tablet, laptop or other portable device to insert order of client. There is a rule in company that any order shouldn’t have same client id and project id. If same client give order for same project, it should be added in original order. Original order should be edited. It shouldn’t insert new order id for same client, project combination. Well, we can define composite primary key or put some validation or check constraint etc. but I don’t want to debate on this rule. If any duplicate order comes, it should be accepted from the sales people but later on it should insert original order id along with new order id in one table so back office team can handle it and sales person could be free immediately without even waiting for validation gets completed. Demonstrating this exercise, we will need one database along with two sample table before we start implementing actual service broker. --making broker enable for database. Now, let us start service broker code. I will not explain each block of code here, if you wish, you can refer my earlier articles given in first paragraph here. -------service broker call from trigger. 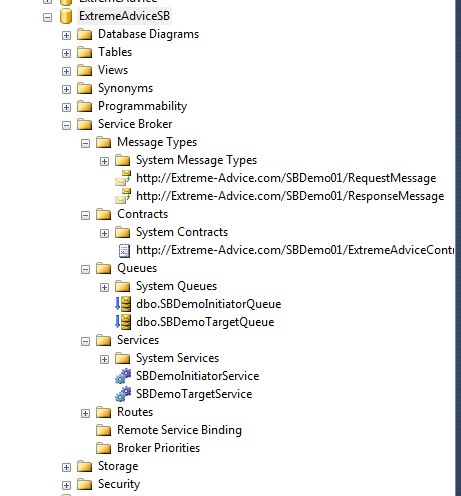 Now, we are ready with service broker architecture and ready to test whether SB is working or not. --you will get one record which we have inserted above. --as we have not inserted duplicate record yet. I have not handled Error properly in CATCH block of Stored Procedure but just printed error message on screen because error handling is out of scope of this article, If you want to handle Error properly in Stored Procedure, have a look at my earlier article here. This entry was posted in Service Broker and tagged Initiator Queue, Service Broker, SQL Server, Target Queue, Transmission Queue on February 22, 2013 by Riteshshah. Last Sunday I have got very interesting question from one of my blog reader and before we discuss his question and solve it, let me give you some basic understanding regarding how message traverse between Initiator and Target Queue in very simple word by eliminating deep technicality. 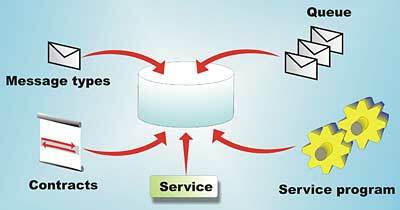 When any message comes to service broker, message has to pass through various way including validation until it reaches to target queue and get processed. Transmission Queue plays an important role in whole service broker architecture. Transmission Queue works as a “postman” between Initiator Queue and Target Queue. Let me give you this understanding in simple words, without including deep technical explanation. Suppose we have two server “S1” and “S2”. We have service broker implemented between these two servers. S1 is an initiator and S2 is a target. S1 sends message to process to S2 and S2 replies back to S1 via Transmission Queue. Here is simple explanation in brief wording. S1 send message to process to S2 via Transmission Queue and starts conversation dialog. When S1 closes the conversation, it acknowledge the same to S2 and message gets deleted from the transmission queue of S2. Please note that, our task get completes in first three steps whereas fourth & fifth steps are formality to close open conversation in S1 & S2. I have written articles to watching the message count currently stays inside different queues. One of the blog reader has implemented the functions I have given in both of the above articles and found that his initiator and target queue always having few hundreds message in peak business hours and become even zero many times but his transaction queue in target server (S2 in our example) having millions of message unprocessed. He wanted me to help him in dealing with that huge queue. Obviously I don’t have access to his server so I have to guess after getting certain information from him. I have asked him to execute following query in his S2 server ‘s database where he has setup service broker and transmission queue showing millions of records. He sent me approx million+ records in “MessageNeedsToClose” and less then hundred count comes in “MessageToKeep”. SELECT query before the UNION ALL clause checks where the row in transmission queue is having any message inside it or not. If Message_Body is NULL then there is no message at all. If “is_end_of_dialog” is 1 then that message is just an acknowledgment nothing else. So if there is no message to process in message_body and if message is just an acknowledgment, we can probably close it to fix the high number of queue one time, if message is already closed from initiator side. Reader has already told me that transmission queue on initiator side (in server S1) always stays below 1000 and become zero also so there is no chance that the million message we have seen in S2 is still there open in S1. Since I didn’t have access to his server to investigate further and the messages we have in target transmission queue is not a real business process, we can close that dialog. If I would have access to server, I would run profiler for broker in S1 as well as in S2 to see what is happening with that big transmission queue but the reader was already convinced and wanted to settled down by closing the conversation of dialog. I have written one customized Stored procedure for him to create on Server S2 in the database where he has Service Broker setup. --if it is alive, we shouldn't close that message. -- --Service Broker in Initiator Server. Please note that I have investigated this issue without accessing live server of blog reader. Whatever suggestions I have given here is going to affect your live production environment if you are executing this script in production environment so please give a second thought and do it at your own risk. I have written some other articles related to service broker, if you are directly landed to this article and new to Service broker, have a look at following articles which covers Service Broker concept from scratch. This entry was posted in Service Broker and tagged Initiator Queue, Service Broker, SQL Server, Target Queue, Transmission Queue on February 20, 2013 by Riteshshah. If you are new to Service Broker and want to know what service broker is and where can we use service broker, you can have a look at my two earlier articles. If your database is not already enabled for Service Broker, have a look at following link to know how to enable Service Broker for database in SQL Server. Once you are ready with basic understanding of Service broker, we can, now, focus on developing architecture for service broker. This article will show you very basic architecture of service broker without much complexity so that even beginners can understand it easily, later on I will come up with some exciting and complex architecture of Service Broker. Creating sample database and enable service broker for it. Now, creating two different message type. One for request message for initiator service and another one for response message for target service. Note: If you are not aware with “Message Type” and other service broker related terms, please click here. Now, we will create one contract which will define which message type will be used from initiator as well as from target. Once, you are ready with Contract, it is a time to define two queue 1.) Initiator Queue 2.) Target Queue. Which will be used by core logic or service program. Initiator queue will generate message/request which will be sent to target queue after validation. Target queue will process message/request and generate response message and send to initiator queue. After having both the queue, need to define service which will work for the same contract we have created above in our example. We will generate two message from initiator and send it to target with “BEGIN DIALOG CONVERSATION” command. Since we have generated two message from TSQL given above, we can confirm the same with “SBDemoTargetQueue” hidden table of target queue. Now, we have to message received in target queue which we have seen above. Now, question is, how to process it? Well, we have “RECEIVE” command to process the record by reading “SBDemoTargetQueue” hidden table. Here is the code which will process one record from target queue table. 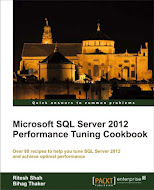 Since we have two records in target queue, we have to execute following TSQL two times to get both record processed. Once you are done with both the message from target queue, you can confirm that there is nothing left in your target queue’s hidden table. This entry was posted in Service Broker, sql server and tagged Contract, Initiator Queue, Message Type, Queue, Service, Service Broker, Target Queu, Transmission Queue on February 14, 2013 by Riteshshah.